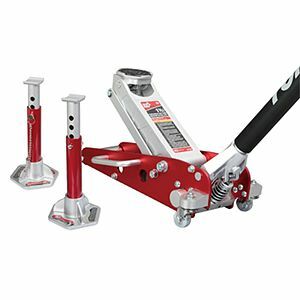 1.5 Ton Professional Low Profile Aluminum Service Jack is built with high strength aircraft grade aluminum, and has a foam bumper on handle to prevent damage to vehicle finish. The built-in safety overload system prevents use beyond capacity. 3 Ton Professional Aluminum/Steel Jack Stands are made of heavy-duty tubular steel with aluminum base. This service jack has a secure 6 hole adjustment, flanged top, and an extra large cast aluminum base.